I delivered this cake last week to a gorgeous hotel, Michaels Manor in St Albans. It was for a fabulous couple and I was very privileged to bump into the bride as I delivered it. 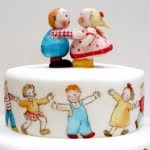 It's such a pleasure to see peoples faces when you show them their cakes. I'm always really nervous that I will have done something completely wrong, but so far this has never happened. The bride was totally thrilled and thought the cake 'perfect'. 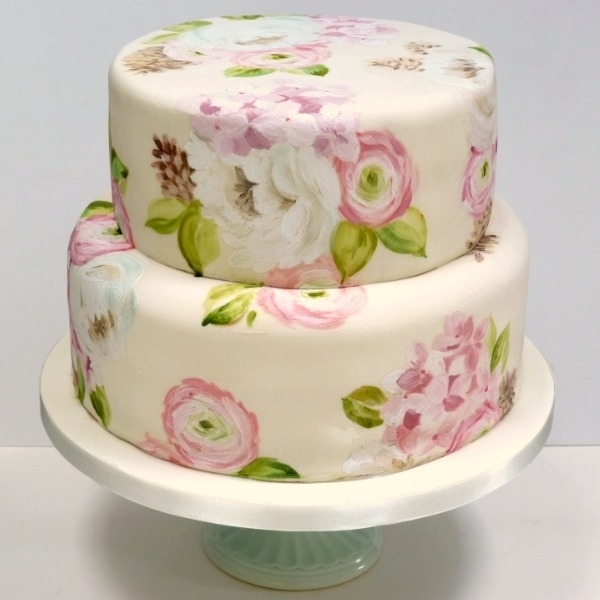 She wanted a painted cake to match her bouquet of ranunculus, hydrangea, peonies and pine cones. I have never really painted any of these flowers before so I was quite nervous, I always am with new designs, until I have started and can see it will all be OK. 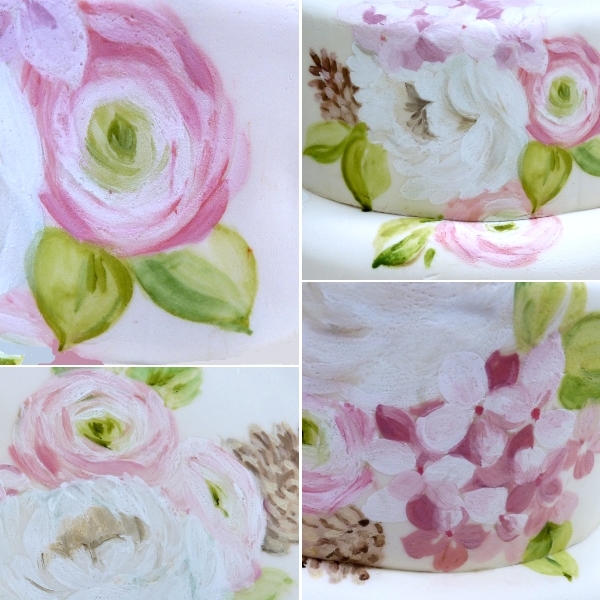 I really enjoyed painting the ranunculus which are one of my favourite flowers. They have an almost abstract feel, but so romantic. It was an absolute pleasure to paint this cake. 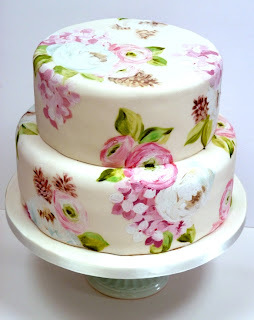 If you would like to learn how to paint on cakes, I have some spaces available in my next class. It is 25th June in Berkhamsted, Herts (UK I'm afraid). Please e-mail me at nevie-pie@hotmail.co.uk for details. Natasha...that is just beautiful! I'm ..almost... speechless. so there! 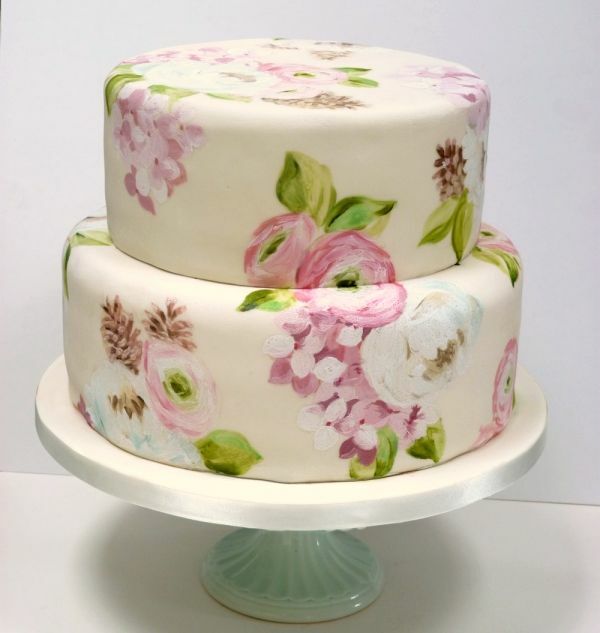 What a pretty cake! I also a big fan of ranunculus flowers, they're so lovely! Beautiful, and very unusual too. Always good to have a unique wedding cake! Gosh that is stunning!! What a talent you have!! Gosh that is such a beautiful cake, you are AMAZING! Awesome - as always. Love seeing your new creations. Wonderful perspective as the flowers tumble from one layer to another. It is a piece of art, and I would be hesitant to serve it! If you are an artist, your works are wonderful. 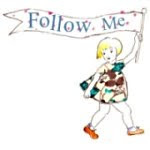 Please visit my blog, I would like you to know my work and give me your opinion. A big hug. This is absolutely beautiful and unlike any other cake I have seen! This is beautiful, wonderful work indeed. It's absolutely stunning! I love it! I would love to take one of your classes, but it's a bit far unfortunately--what sort of paints do you use?